Current Itinerary: Same...see previous journal. I actually slept in until about 10, which has been a rarity for me on this trip. We were happy not to have to get up and head to the diving school. Wow, three straight days of having something to do all day and we were already wiped out! Looks like being unemployed has made us soft:) I lounged around writing until about noon and then went to do internet for awhile while Jodi headed up to the split. I joined her around 1:30 and the water looked pretty inviting. As I said before, the split was created by a hurricane years ago...the water that flows through has widened the gap over the years and there is a pretty strong current. We swam near there but it was a bit of a work out to stay in one place. I actually brought my snorkel and mask with me and swam around a little looking for fish. I didn’t see that much except for a starfish that I played with for like 30 minutes. They really are fascinating...I don’t think I realized how much they can move or how many little suction cup feet they have that come out of their arms. We decided to go up to the bar that’s at the split called the Lazy Lizard. 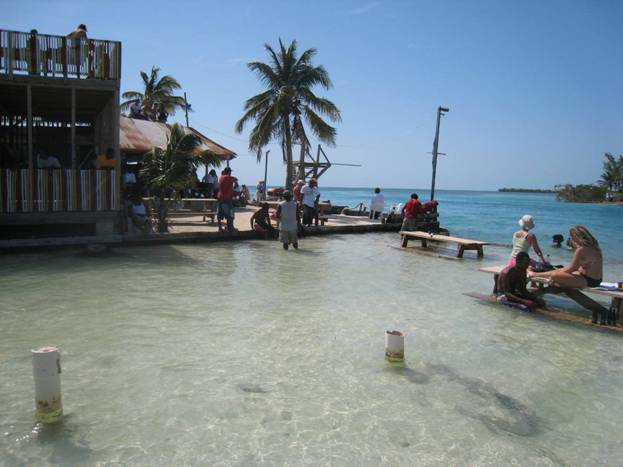 It’s a pretty cool place that I guess has been there for years...they have a diving board that people jump off of into the water and they also have some picnic tables that are in the water so you can actually sit in the water and have a drink! As you can see, it’s pretty awesome. One funny thing that happened was that Jodi saw some guy carrying a camera in a waterproof case and it looked a lot like Pat’s camera that she had lost the day before. We really thought we had found it! Jodi went over and asked the guy where he got it but it turned that it was his and we looked like idiots for basically accusing him of stealing it. We ended up meeting some girls at the bar that were cool...they had come down to Belize on a trip for a week with their husbands/boyfriends. 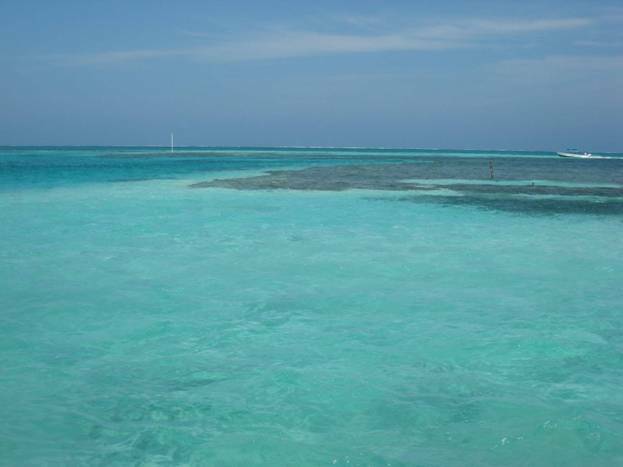 There were 8 of them total and they had rented a big house on one of the smaller Cayes, (I think it was Wind Caye) and they had an entire island to themselves as it’s the only house on the island! It sounded pretty cool. The only downside is that since there is nothing on the island but the one house, they have to take a bit of a boat ride to get to the action (but that is provided and there is a guy waiting at their disposal at all hours). Still, it sounded cool...maybe a nice idea for an extravagant vacation years from now. We told them they were lucky they didn’t come one week sooner b/c they would have been rained on the whole time. We finally left the split and went to a place called Femi’s to get a sandwich and we ran into...you guessed it, Pat and Elliot. She was very happy to report to us that they had found her camera! The guys they did the snorkel tour with went searching for it early the next morning and found it tangled in some mangroves! That is what I call lucky! Good thing we didn’t try take the camera from that guy we saw at the split! After they left we sat there and had food and some delicious rum punch. We ended up staying there and hanging out in their hammocks for a couple hours just having our drinks and talking...it was a perfect afternoon after having been pretty active the previous 4 days. We didn’t’ do much else that night...we ended up doing the wine and cheese thing again and just chilling in our Cabana. It was an awesome Saturday. We thought our Saturday was chill, but this was a lazy Sunday in every sense of the phrase. I got up pretty early but spent the entire morning reading my Michael Connelly book. Finally hunger drove us out of the room, plus we wanted to sign up for a dive the following day. We took care of both of those problems and then made a quick stop at the internet. After all that strenuous activity we decided to go back to our place and sit outside in our hammocks and read all afternoon. Yes, I know, life is real tough for us...but hey , it was Sunday! We did venture out that night for a nice little dinner at the Sand Box but that was about it! The only negative thing that happened that day was there was a pretty bad wind storm that night...little did we know that it was just the beginning. We got up for our dive in the morning and got to boat dock at 9:00. It was still pretty windy so we were afraid they might cancel the dive. Instead of canceling, they just changed the dive site to a place that’s known to be less choppy. It doesn’t really matter to us anyway...every dive is a 10 at this point! We checked our equipment and met some of the other divers and off we went. It was 45 minutes out to our dive site, which was called Spanish Bay. The dive was just as good as most of the others we’d done...we saw a few new fish this time like the trumpet fish. 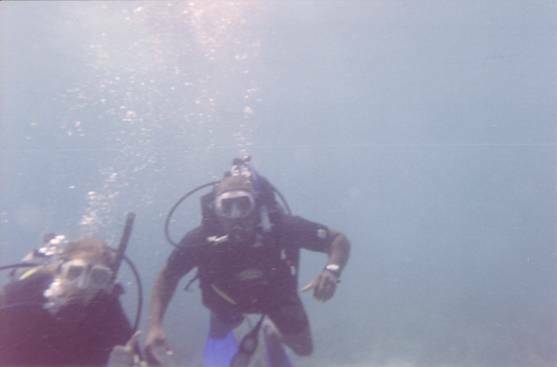 We went all the way down to 70 feet on our dive which really is getting down there! Just for the record...I think the deepest you’re allowed to go for a recreational dive is about 140 feet, but you have to have a different certification. For our second dive that day, we were only going to be going to about 50 feet so we were able to bring our disposable underwater camera! Visibility was slightly less that day, and the camera is cheap so the pictures aren’t of the greatest quality, but they were still cool enough for us! 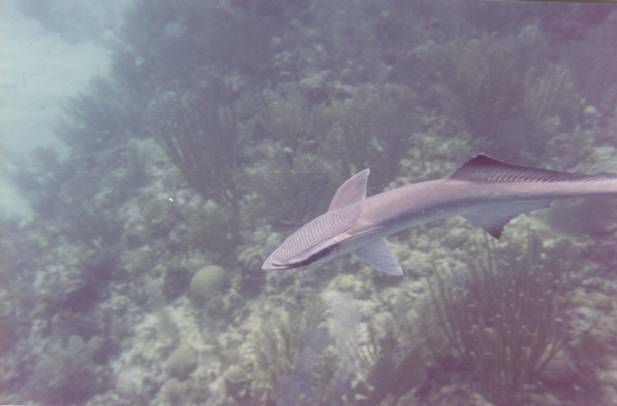 The highlights of the dive were a giant sea turtle we saw, which I didn’t really get a picture of, but we did get a great picture of this remora shark! On the walk back home from the dive shop, it was still very windy and since the streets are not paved here and only made of sand, it was VERY dusty out as well. It was brutal on the contacts and in some spots, down right painful to get pelted by the sand. We probably would not have even gone outside again that night but we had to eat and I needed to go to the ATM. Only half of our goals were achieved though because when I went to the bank, the freaking ATM ate my card. It looks like the bank reported it stolen because I was withdrawing from ATM’s in foreign lands. Interestingly, it has been over a month and they are just now doing this? Strange. Seems like they would try to contact me via e-mail or something. I guess it’s good the security measures are in place, but I knew it was gonna take some sorting out the next day. Most of all, I was worried about getting my card back. We have back up plans in place in case of such a situation, but the idea of making several calls and then trying to have a new card sent when we have no clue where we will be is not appealing. Anyway, it was later at night so there was nothing I could do until the morning. After dinner, we stayed holed up on our room which felt like it might blow away. There was sand blowing in under our door and it was almost impossible to sleep with all the wind. The wind was so strong that it kept on blowing our wooden blinds wide open and then all this sand would blow in (you can see from the video of our place that we were right on the beach). I kept having to get up to close them every 30 minutes. Needless to say, I didn’t sleep too much ended up just reading most of the night. I got up at 6:00 so I could go call the bank back home as they were opening and try to straighten everything out. After talking to 4 different people which took about 6 different calls, I was able to get them to change the status on my card. It’s a good thing it was a small local bank because I’m sure if that was Bank of America it would have taken several hours just to navigate the automated system and talk to a human. Now all I had to do was physically get the card back. After some of the good old Caye Caulker banana bread, I showed up to the Belizian bank just as they opened at 8:00. They were able to retrieve my card and to my surprise gave it back to me. Right on...back in business. That was a potentially disastrous situation and by 8:15, all was well again...accept for the fact that I was in the midst of a dust bowl. We decided to leave that day b/c we figured if we stayed we would be stuck in our cabana all day. 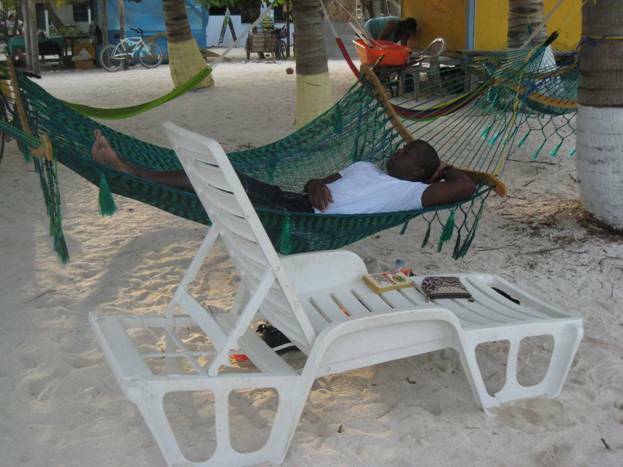 We had stayed an entire week in Caye Caulker...the longest we have been anywhere so far, but it was great. Truth is, if not for the wind, we may have stayed another day or two. It was the kind of place you could easily end up staying in for a month or so. We won’t forget the awesome diving and snorkeling we did there...certainly some of the best in the world. We headed for the ferry around 11:00 and headed back for the mainland and on towards our next stop.